Your answers: Is the latest analogue synth revival a backwards step in technological advancement? Are we just too hooked on these? There is no doubt that analogue synths are great, be they past or present. The current analogue revival boom has seen a fair few manufacturers going back to their roots with new products. It does raise one question though: is this revival to the detriment of the technological advancement of synthesizers? Should we be looking forward and striving for new ways to create sound instead, or has everything already been invented? "I welcome the availability of modern analogue hardware. Analogue synths sound like an aural manifestation of electricity to me. Digitals do not. Now, you could argue that the MS-20 mini is a step backward, but then Korg put out the Minilogue." "No, there's plenty of companies doing innovative new things with analogue synths. Just look at Eurorack, analogue is about more than just nostalgia." "I don't think they should be re-release anything. Making new synths with new capabilities that happen to incorporate analog sound sources are my favourite, such as the Elektron Analog Keys, or the Dave Smith Prophet '08. Some synths sound great despite being digital, like the Modor NF-1 or the Waldorf Blofeld." "Every time Windows and its ilk shut down for updates without warning, I say analogue revival is a forwards step!" "I don't really care what type of sound generation technique you use. As long as the sounds that come out of the box are cool. And so far, I've never heard anything that can beat analogue. Simple as that." "Who cares? It's all sound and purely a raw material. It's the master who knows what to do with it. The internet is saturated with hardware and software developers making us think we need what they sell. Ears and ideas are more important." "It really depends on what the builder is trying to do with it. If they're just releasing an old setup with a few new features, I'm usually not interested. If they're taking analogue and making it better or using it some new inventive way then all the power to them. 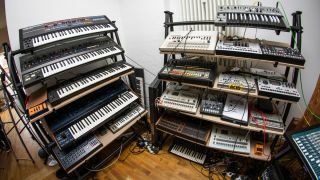 That said, there's very little I wouldn't do for an original Oberheim synth or a CS80... that costs less than a new car." "Yes, in a same sense that building violins and pianos today is technological step backwards." "I like hearing DJ's claiming they love the warmth of analogue… then I listen to their tracks and everything has been compressed and crushed to death lol." "It feels like overkill, but I would not complain. I hate that old gear is too expensive. You either produce great tracks or not. It's wonderful to have choices." "No one asks if a classic guitar style is a step back in technology. They revel in the sound that they miss when they had their active Roland MIDI guitar. It's about good sound, fun and inspiration. If I find these elements using a remake of univac, who cares?" Yes! All these sounds are easily achievable now… waaay too much gear and crap is no longer needed. Travel light - less headaches!" "What the f*** do we care? What we care about is what music is going to be!" "How many analog synths does the world need? Computing power has been skyrocketing but instead of new sound synthesis tech, all that power is used to better emulate stuff that was out decades ago!" "There are no backwards steps in art. Just steps."